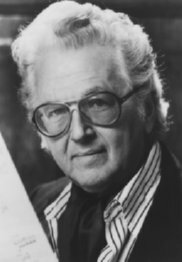 Born 12 February 1923 in New York, Mel Powell began his musical life as a prodigious jazz artist, working as pianist and arranger with the Benny Goodman Orchestra and later, the Glenn Miller Army Air Force Band. Soon, however, a strong compositional instinct prompted his matriculation at Yale University, where he studied with Paul Hindemith. Under Hindemith, and throughout the late 1940s and 1950s, Powell composed primarily in a neoclassic style producing such works as the Cantilena Concertante for English horn and orchestra, Divertimento for violin and harp, and Trio for piano, violin and cello. In 1959, Powell's musical personality blossomed and the influence of Webern was manifested in a brevity of forms and transparency of textures. An innovative and consistently adventurous musical style embraced experimentation with extended string techniques and invented notations (as in the Filigree Setting for string quartet), musical blocks of chords, pitch sequences, rhythms, and colors (represented in Modules: An Intermezzo for chamber orchestra), and tape and electronics (such as in the song cycle Strand Settings: Darker). Duplicates: A Concerto for Two Pianos and Orchestra was awarded the Pulitzer Prize in 1990 and illustrates Powell's meticulous craftsmanship and singular skill at assembling richly expressive yet intricately complex musical structures. Powell was one of the instrumental founders of the California Institute of the Arts. He served as dean of the music school from 1969 to 1978, and, at the time of his death on 24 April 1998, he held the Roy E. Disney endowed chair in music composition. Powell received awards and commissions from Sigma Alpha Iota, the Guggenheim Foundation, the American Academy of Arts and Letters, and the NEA. Among his final works were: the Piano Trio '94; the Sonatina (for solo flute) and the Sextet, premiered in 1996 by the California EAR Unit; the song cycle, Levertov Breviary, premiered in 1997 by soprano Judith Bettina and pianist James Goldsworthy for Harvard University's Fromm Foundation; and Seven Miniatures -- Women Poets of China, a work for harp and voice premiered at New York's Merkin Concert Hall in October 1998 by Susan Allen and Anne-Lise Berntsen. His music is published by G. Schirmer, Inc.